I’ll answer this provocative question now. DCMA, local and headquarters, are an EVM contractor’s “friend” with remarkable, but not unlimited, patience. 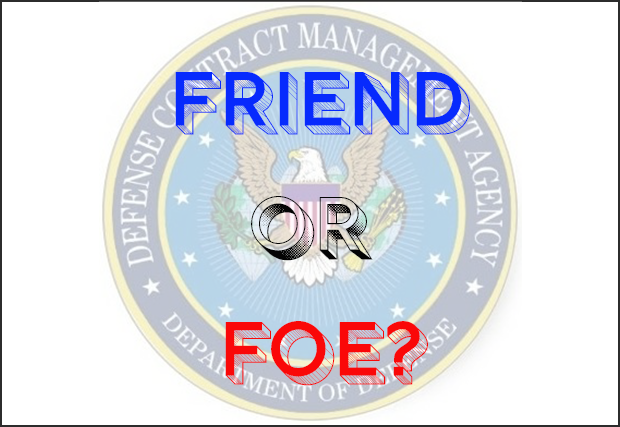 When required, DCMA can become the contractor’s “tough love” friend. DCMA and the contractor share the same interests – successful contract performance. DCMA is part of a triad that includes the Government’s program team, the contractor’s program team and their DCMA counterparts. The title “Defense Contract Management Agency” reminds me of “grilled cheese sandwich” – the recipe and the product are in the name – “contract management” leads to well managed contracts. Contractor A has learned that their collocated DCMA has concerns about the company’s EAC process and resulting declared EACs. The company has learned that a Level III CAR on GL # 27 is being considered. Contractor A’s senior management decides to replace their EVM Core Leader with “new blood” to improve the company’s “relationship” with DCMA and avoid a Level III CAR. Contractor A’s new EVM leader meets with her team and with the program managers that have an EVM contractual requirement. Company A’s new EVM leader is told that DCMA’s EAC concerns are a new issue. The company’s new EVM leader asks to meet with her DCMA counterpart to discuss their GL # 27 concerns, and to present a draft of a Corrective Action Plan (CAP). During the meeting with DCMA’s EVM leader she mentions that the EAC concerns were a surprise to the company. The company’s new EVM leader briefs her draft CAP to her DCMA counterpart. DCMA issued a Level III Corrective Action Request (CAR) to the contractor and is considering withholdings as an incentive for the company to quickly improve their EAC processes. 1). Identify the weaknesses in your existing EAC processes. For each weakness, identify a corrective action. As much as possible, “mistake proof” your new processes. You should consider a review of several 100% complete contracts, and “replay” those contracts month-by-month using your new EAC processes to test their effectiveness. 2). As noted in our CAR, the company is required to report progress on the Corrective Action Plan (CAP). You should treat your CAP as a program. At a minimum, you should have an IMS and use appropriate earned value techniques to measure progress. 3). A sister division in your parent corporation, has a very mature and effective EAC process. You should considering asking for their assistance as you develop your CAP and begin its execution. 1). DCMA “local” knows your company much better than you might think. 3). A CAR from DCMA informs the company of “what” needs corrected but not “how” to correct the issue. That said, DCMA knows what will or will not work. Maintain a dialogue with DCMA. 4). “Compliance” is a lower bound for performance. DCMA will not object if a company decides to improve well beyond mere compliance. 5). Please consider the possibility that what may appear to be a “new” problem for your company, may have already been solved by another company. Find who has already solved your “new” problem. Ask for help. DCMA will never be a foe. Never.